As we approach Spring Break, we would like to take some time to acknowledged and thank the 6th and 7th grade students for their efforts this week while participating in the SBA. This assessment is a Pilot and students were aware that they wouldn’t see the results…another words, “it didn’t count”! Yet, to the credit of our community each and every student worked their tails off. This was not a timed test, and many students came back during their study halls and intervention period to complete the test. The work ethic and attitudes were far above the norm for early teens. Part of me is surprised, yet time and again our students respond to our request. Another example of this has been occurring since Christmas Break. We noticed a very high percentage of the students were using the handicapped doors when they arrive or leave school. These doors stay open longer and we could feel the cold air rush in. I made a simple announcement to please not use the doors unless you have special circumstances. We have observed that the doors rarely get used now and students have been monitoring and self correcting each other. These two examples are not just compliance, but truly good citizenship and we would also like to extend this thank you to the parents and relatives of our students. Reading is the first step toward complete literacy. Listed below are a series of quotes from Mike Schmoker in his book, Results Now, that I hope will provide some context behind our approach at OHS to teaching the Common Core State Standards which are highly focused on reading, writing, and thinking at high levels. Of course these standards include content learning in English, Math and Science as well, but a considerable focus in preparing students for post high school success is around high levels of literacy. …Every profession rewards those who are highly competent at devising examples that exemplify one’s point, generalizing one’s conclusions…practices that come into play in every field…even the most brilliant scientists don’t advance in their field unless they can explain to relative non-specialists—in a grant proposal, for example. “We’ve seen how literacy, rightly understood and acquired, changes lives. It affects our ability to think, to reason, to speak, and to govern. In this chapter, however, we will see that current practice is very much at odds with the best we know about helping students become authentically literate. Literacy instruction presents us with a supreme opportunity for the general improvement of schooling. I have asked numerous audiences in dozens of states the following question: What two activities are least apt to occur during a typical class? In every case, after a quiet moment, come the answers, one then the other: Reading. Writing. Heads nod; there is some nervous laughter. I always ask the audience if something so counterintuitive could really be true. I get lots of uncomfortable acknowledgements. I then ask if this lack of reading and writing could possibly be good for kids. Lots of scattered responses: No! I ask a few more related questions. What do we know about the nature of most reading assignments and class discussions? Are they typically lower order, focused on facts and recall; or higher order, focused on interpretive, open ended discussions? The answer is loud and immediate: Lower order. I think this series of quotes are fundamentally true, but we have made substantial efforts to confront this reality and change it at our school. Literacy instruction presents us with a supreme opportunity to improve Oostburg High School. The only way that is going to actually happen is if reading and writing are in the process of going from “least likely to occur during the typical class” to “most likely to consume considerable time in classes.” And this reading, writing and thinking must be taught with clarity and rigorous expectations. All students can learn at high levels! Many of you may be aware that Oostburg Elementary School was recently recognized for being one of the top 65 schools in the State of Wisconsin for Title 1 achievement. We feel this honor is significant since there were over 1000 schools eligible for this award. This award is based primarily on data gathered from the WKCE state assessment, and although this assessment has questionable overall value (The WKCE will be replaced by what we feel is a much better assessment, The Smarter Balanced Assessment, in the 2014-15 school year.) we feel the specific data referenced in this award is a direct reflection of the excellent work our staff is doing to help all students learn at high levels. Each of the top 65 schools were recognized for their work with specific subgroups of students. Our focus on early interventions for struggling students is reflected in the WIN (What I Need Now) groups at OES and our intevention blocks at OMS. In addition, OHS has incorporated support structures for some of their most challenging classes, and we are seeing results. All of this work has allowed us to place an even greater focus on student learning. Although that may seem like an obvious focus for schools, we believe that many schools operate from a mindset where teacher activity takes precedent over student learning. Teachers in these schools operate under an, “I taught it, they just didn’t learn it.” mindset. We believe that student learning is our responsibility as a school. Student learning is what we do and where our expertise lies. Our response as a school when students are not learning is very different than it was 5 years ago, and we are proud of the efforts and more importantly the results we are seeing. We have a good school, but we want to be great. We are not there yet and hopefully never will feel as though we have arrived. That being said, we are excited that the progress we are making was recently recognized. As many of you may already know, our current state assessment the Wisconsin Knowledge and Concepts Exam (WKCE) is being replaced with the Smarter Balanced Assessment. This new assessment will be one of the indicators on the Department of Public Instruction (DPI) school Report Card monitoring student growth and achievement. To prepare for this we have volunteered to pilot the SBA at the 6th and 7th grade levels. Our seventh graders will be testing March 19th-21st in English/Language Arts. The sixth graders will be testing the same week in Mathematics. More information can be gleaned from the following websites. In addition, an Alert Now message will be sent as a reminder to all parents of students in the pilot test. In an attempt to supplement our core instruction in Math, Science and Language Arts we implemented an Intervention Period 2 years ago. Our Math teachers have done a really nice job of identifying areas of need, organizing learning groups, and utilizing instructional strategies to close the gap on student achievement. The 6th grade has three different groups based on needs working with Mrs. Holmer, Mr. Veldhorst, and Mrs. Wynveen. In 7th and 8th grade Ms. Gardon has divided each grade level into two groups and meets with these students opposite of PE or Band/Choir. Below is a graph of 7th grade progress from Ms. Gardon’s students. Green is where we want all of our students…we believe this trend will continue. The first triangle displays where our 7th grade students tested in the fall. Typically the percentage is in the 35-50% range with our end year goal of 80%. 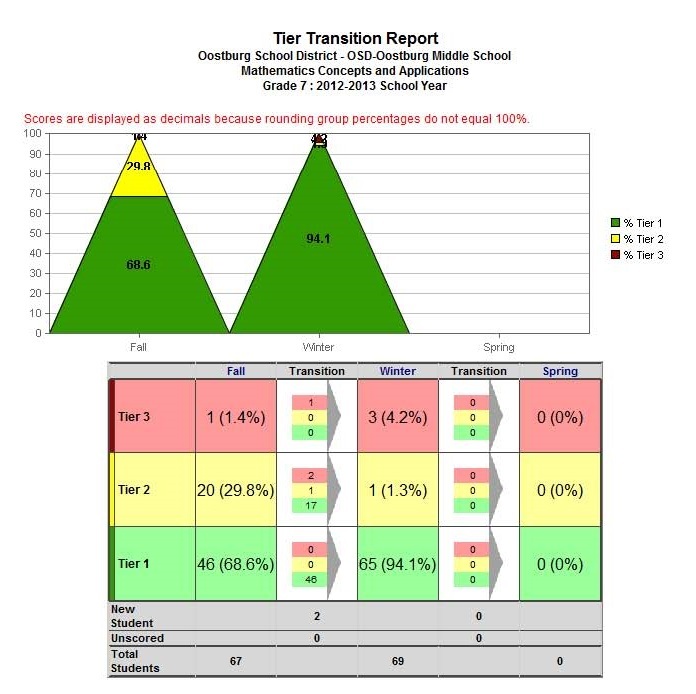 The second triangle shows the gains of our Tier 1 (Core instruction). We continue to progress monitor the yellow and red groups and make modifications to our small group instruction. We will have a final AIMS assessment in Spring.